Barbara and Joan in some of their many costumes which their Mother made. Barbara top middle. Others unknown. Notice the wooden gate to the side yard. The Thomas family about 1938-9 in Tallahassee Florida. 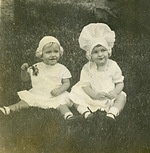 Joan and Barbara attended Florida State College for Women (FLASTACOWO) which is now FSU. Barbara and Joan Thomas in Evergreen Cemetery about 1920. The Thomas children at DancyT. Back left, Joan Thomas. Back right, Barbara Thomas. Front, Percy Thomas Jr. About 1935. Jessie Thomas Morgan (P.L.Thomas's younger sister) and Joan Thomas on Main Street near the W.H. Newell Bakery. Percy Leon Thomas, Jr. in the back yard or DancyT about 1930. Percy Leon Thomas, Sr. and children superimposed. Thomas car on 9th Street south end of DancyT. 192? Copyright 2005. All information and photographs on this website are protected by copyright by Beth Learn, learn/yeats & co. Personal use only. NO COMMERCIAL USE OF ANY KIND WITHOUT WRITTEN PERMISSION.